The sixthreezero Around the Block Women’s 26-Inch Cruiser Bike has so much to offer. 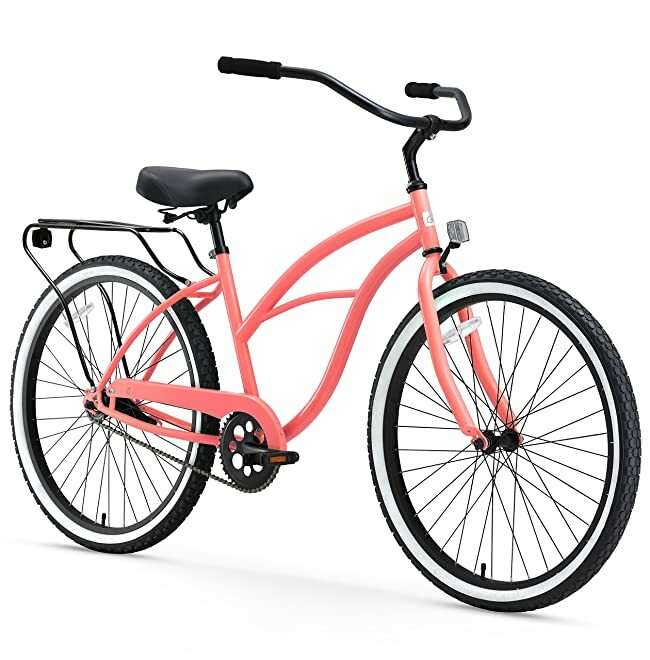 This beach cruiser bike has unique features designed with your comfort in mind to get you around town in style and ease. Join me for a detailed review of the Around the Block bike, and you’ll see what everyone’s talking about with this smooth ride. What Makes The sixthreezero Around the Block Different? The Around the Block sports a 17-inch frame of steel for added strength and resilient aluminum wheels. It features the unique sixthreezero Smooth Cruise Configuration for a gentle ride, and the black foam grips are custom-made for the cruiser handlebars that will let you sit in a relaxed, upright position to help you enjoy the scenery on your travels. The Around the Block also makes it easy and convenient to add a sturdy storage rack, a secure holder for a water bottle, a roomy basket, or a child’s seat to fit your needs and lifestyle while cruising around town. The single-speed version of the Around the Block is perfect for comfortable, short trips around town or a scenic ride along the shore, and it comes equipped with a rear luggage rack for toting around your items. It’s easy to stop with the coaster brakes, and all you have to do is pedal backwards to activate their speedy response. The single gear allows you to travel without the headache of additional wires and components, and it’s also a snap to assemble. The seven-speed style of the Around the Block is ideal for longer treks or steeper terrain, for the seven different gears allow you to choose the torque and resistance that you need to climb a mountain or go further up the road. With this version of the bike, you use hand brakes for both the front and rear brakes to ensure a precise stop. The waffle-tread, cruiser-style wheels create a smooth ride, and the rear storage rack lets you carry all of your stuff in style. The Around the Block is available in four gorgeous, retro colors. You can purchase both the single and seven speed in bright coral, light plum, mint green, or teal blue. All of the colors feature the classic white-walled tires and come in the same show-stopping, retro design. What Do Verified Customers Love and Loathe about It? Customers love that this bike arrives 85 percent assembled and with the necessary Allen wrenches to complete the process, but it also has the option to be purchased already assembled if you prefer. The instructions are easy to follow, and many customers had this bike put together and ready to ride in less than an hour. The single-speed version of this bike is less complicated to get up and running than the seven-speed style. The overall design of the bike promotes comfort and easy riding, according to verified customers. Many ladies found that the seat was on the softer side for a bicycle seat, which made it more comfortable, and it comes with a back luggage rack already attached for additional convenience. The color of the bike is often noted to be vibrant and closely resembles the pictures online. Many people found this bike to be a great fit for them with its quality materials and great design. The seat and handlebars are simple to adjust to get the right height for your needs. Customers also loved how smoothly this bike can travel with its cruiser-style wheels, and it can easily traverse potholes. A few customers noted that some items were not their favorite with the Around the Block. A couple of people noted that their bike arrived with a few minor scratches due to insufficient packaging during shipping, and one person mentioned that the emblem on the front of the bike was not securely attached. For a few ladies, the fit of this bike may not be ideal. If you have shorter legs, then you may find it challenging to lift your leg over the center bar. Another lady mentioned that the tire seemed close to the frame of the bike, and she was on the verge of hitting that tire with her foot frequently, especially when turning the bike. Who Should and Should Not Buy It? The Around the Block can be the perfect ride for a lady who is five feet tall to six feet tall. It’s great for a ride along the coastline, getting to class across campus, or running errands around town. This is an ideal bike for long, leisurely rides with your family on this gorgeous, retro-style cruiser. Buy The sixthreezero Around the Block at Amazon Now! There are a few ladies who perhaps should not buy this bike. If you are shorter or taller than the recommended heights, then you may find this bike uncomfortable for you. Also, this may not be the best bike for you if you struggle with assembling bikes at home, for the customer service can be challenging to deal with over the phone. Additionally, this is a beach cruiser bike and is not ideal for women with different biking needs. While this bike is great for shorter distances and comfortable tours, it is not the best option for rugged mountain trails or performing stunts and ticks. If you’re looking for a lovely and high-quality bike to get you around town or along the shore, then the sixthreezero Around the Block is perfect for you. It requires minimal assembly, and you’ll be off on your next adventure in no time at all. The Around the Block will transport you near or far in grace and style.